Craftsmanship, Quality and Excellence. At Cara Custom Homes, these are not just words, but the goals we live up to when building each and every custom home. 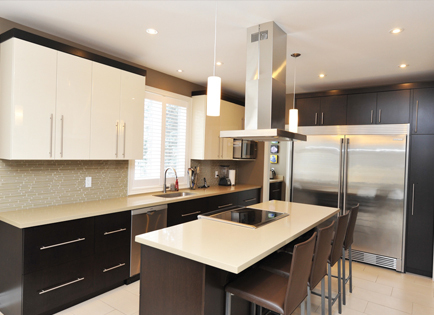 Cara Custom Homes has quickly become the premier custom homebuilder in the greater Hamilton area. Founded in 2006 by Enzo Carobelli, he personally oversees construction of every project until completion. Attention to detail, quality construction and pride in workmanship is the foundation of the company. Cara aligns itself with some of the best craftsmen in their trade who share the same level of passion and commitment to ensure the highest standard of quality is being delivered. Building a home is a big decision, and, for most, a dream come true. It would be our pleasure to build the home of your dreams that fits your lifestyle and needs! Cara Custom Homes is recognized for high standards of excellence by the Tarion Warranty Corporation. 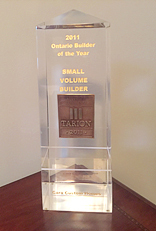 As a premier custom home builder in the small volume category, Cara is proud to receive the Tarion Award for Excellence for 2011.